Here is a way to build a personal library of orchestral repertoire. This is a series of CD roms that contain the Kalmus editions of a large number of original complete oboe parts. There are four volumes in the series containing 200 orchestral works by Beethoven, Schubert, Mendelssohn, Berlioz, Weber, Rossini, Donizetti, Auber and Cherubini and many others. All of the parts on the cd roms are read with a free program called Adobe Acrobat Reader, and the parts can all be printed out. Although they are Kalmus parts, and we all know that there are famous mistakes in each one, it would cost you a mini-fortune to buy each printed part separately. This is definitely a fantastic option. 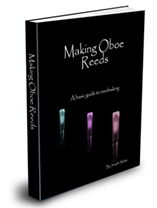 Below are the editions for oboe, but if you would like to find the cd’s for all the other orchestral instruments, go over to Sheet-Muisc-Search.com and they are listed. This is good stuff, especially if you don’t own the complete parts to these pieces. Remember that during orchestral auditions, many times the parts other than the excerpts are asked for. Be prepared for that. Learn the whole piece.